Has the National Living Wage Affected Your Business? Back in April 2016, the National Living Wage was introduced, meaning employers must pay their workers aged over 25 no less than £7.20. Upon announcement, it was predicted by the Office for Budget Responsibility that it would lead to 60,000 job losses by 2020. However, so far this hasn’t been the case. In the first report published this week, it was revealed that the NLW hadn’t led to job losses, with employers instead raising prices or reducing profits rather than cutting jobs. We’ve brought you our analysis to keep you informed! The wage is currently set at £7.20 an hour and is expected to rise to around £9 by 2020. The National Minimum Wage continues to apply for people aged 24 or under. A survey of 500 businesses revealed that 36% of firms were carrying the burden of higher costs through increased prices. Many firms have opted to take this course of action or take a profits hit in a bid to deal with the changes to wages. 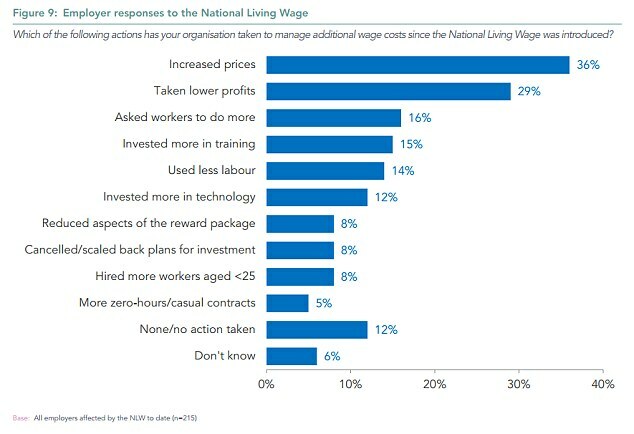 Approximately 14% of companies said they ‘used less labour’ as a result of the NLW, with a further 8% of companies reducing staff perks such as Bank Holiday pay, overtime or bonuses for existing staff members. For example, DIY chain B&Q, supermarket Tesco, coffee chain Caffe Nero and the John Lewis Partnership have each removed or reduced several staff payments and perks. However they have argued that these moves were unrelated to the increase in the National Living Wage. As the National Living Wage only applies to staff over the age of 25, 8% of companies have hired more staff who are under the age of 25 to avoid paying the higher wage. Several companies have also said they had cancelled or scaled back plans for investment due to the NLW. If you are concerned about how the National Living Wage might impact your company, then please contact our payroll expert, Lynne Auton today.